An air ioniser (or negative ion generator or "Chizhevsky's chandelier") is a device that uses high voltage to ionise (electrically charge) air molecules. Negative ions, or anions, are particles with one or more extra electrons, conferring a net negative charge to the particle. Cations are positive ions missing one or more electrons, resulting in a net positive charge. Most commercial air purifiers are designed to generate negative ions. Another type of air ioniser is the ESD ioniser (balanced ion generator) used to neutralise static charge. In 2002, Cecil Alfred 'Coppy' Laws was credited with being the inventor of the domestic air ioniser in an obituary in The Independent newspaper. Air ionisers have been used to eliminate the occurrence of Acinetobacter infections as well as reduce static electricity buildup in electronics. Air ionisers are used in air purifiers. Airborne particles are attracted to the electrode in an effect similar to static electricity. These ions are de-ionised by seeking earthed conductors, such as walls and ceilings. To increase the efficiency of this process, some commercial products provide such surfaces within the device. The frequency of nosocomial infections in British hospitals prompted the National Health Service (NHS) to research the effectiveness of anions for air purification, finding that repeated airborne acinetobacter infections in a ward were eliminated by the installation of a negative air ioniser—the infection rate fell to zero. The SARS Pandemic fuelled the desire for personal ionisers in the Far East, including Japan (where many products have been specialised to contain negative ion generators, including toothbrushes, refrigerators, air conditioners, air cleaners, and washing machines). There are no specific standards for these devices. Ionisers should not be confused with ozone generators, even though both devices operate in a similar way. Ionisers use electrostatically charged plates to produce positively or negatively charged gas ions (for instance N2− or O2−) that particulate matter sticks to in an effect similar to static electricity. Ozone generators are optimised to attract an extra oxygen ion to an O2 molecule, using either a corona discharge tube or UV light. Even the best ionisers will produce a small amount of ozone. At high concentrations, ozone can also be FDA in the United States declares that ozone has no place in medical treatment and has taken action against businesses that violate this regulation by offering therapeutic ozone generators or ozone therapy. Ozone is a highly toxic and extremely reactive gas. A higher daily average than 0.1 ppm (0.2 mg/m³) is not recommended and can damage the lungs and olfactory bulb cells directly. A number of studies have targeted negative ion generators. Some studies show that the ozone generated can exceed guidelines in small, non ventilated areas. One study showed that ozone can react with other constituents to increase pollutants such as formaldehyde. 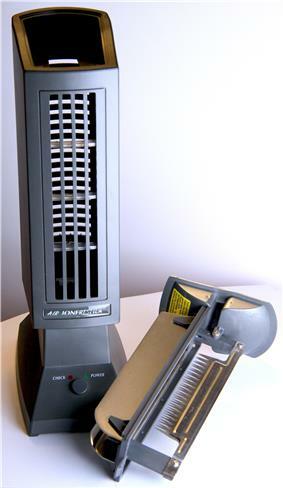 Consumer Reports, a non-profit US-based product-testing magazine, reported in October 2003 that air ionisers do not perform to high enough standards compared to conventional HEPA filters. The exception was a combination unit that used a fan to move air while ionizing it. In response to this report, The Sharper Image, a manufacturer of air ionisers (among other products), sued Consumer's Union (the publishers of Consumer Reports) for product defamation. Consumer Reports gave the Ionic Breeze and other popular units a "fail" because they have a low Clean Air Delivery Rate (CADR). CADR measures the amount of filtered air circulated during a short period of time, and was originally designed to rate media-based air cleaners. The Sharper Image claimed that this test was a poor way to rate the Ionic Breeze, since it does not take into account other features, such as 24-hour-a-day continuous cleaning, ease of maintenance, and silent operation. The United States District Court for the Northern District of California dismissed the case, reasoning that The Sharper Image had failed to demonstrate that it could prove any of the statements made by Consumer Reports were false. The Court's final ruling in May 2005 ordered The Sharper Image to pay US $525,000 for Consumer Union's legal expenses. ^ "Air ionizers wipe out hospital infections". The New Scientist. Retrieved 2006-08-30. ^ Chris Woolston (2004-08-20). 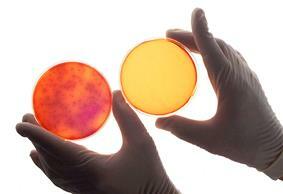 "Ionic purifiers' dirty secret - Los Angeles Times". Articles.latimes.com. Retrieved 2014-02-10. ^ "TITLE 21—FOOD AND DRUGS; CHAPTER I—FOOD AND DRUG ADMINISTRATION DEPARTMENT OF HEALTH AND HUMAN SERVICES; SUBCHAPTER H—MEDICAL DEVICES". US Food & Drug Administration (FDA) website. Retrieved 2006-08-30. ^ Kurtzweil P (1999). "Ozone generators generate prison terms for couple". ^ "Ozone: Good Up High, Bad Nearby". Environmental Protection Agency (EPA) Website. Retrieved 2006-08-30. ^ "Ozone Generators that are Sold as Air Cleaners: An Assessment of Effectiveness and Health Consequences". EPA Website. Retrieved 2006-08-30. ^ "Quantiﬁcation of Ozone Levels in Indoor Environments Generated by Ionization and Ozonolysis Air Puriﬁers" (PDF). Air & Waste Manage. Assoc. 56:601–610. May 2006. ^ "Indoor Air Chemistry: Cleaning Agents, Ozone and Toxic Air Contaminants" (PDF). April 2006. ^ "Sharper Image pays $525,000 to end lawsuit against CU". Consumer Reports. 2006-08-06. ^ "SCS - 963E - Benchtop Air Ionizers - Allied Electronics". alliedelec.com. ^ "Notebooks & Ultrabooks - N51Vf". Asus.com. Retrieved 2014-02-10. Do "corona discharge" devices alleviate asthma?